Product #5806 | SKU C411L | 0.0 (no ratings yet) Thanks for your rating! 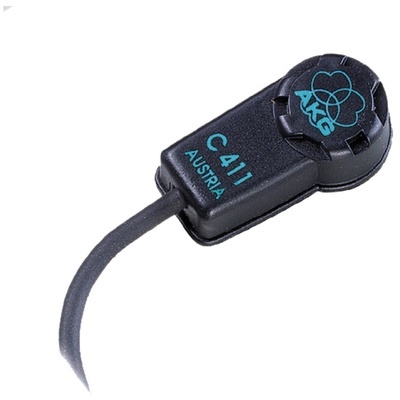 The AKG C411L is a miniature condenser microphone primarily designed for capturing stringed instruments. The flat frequency and signal response is optimised to accurately reproduce the character of acoustic guitar, mandolin, violin, viola, and other stringed instruments. The microphone is easily attached near the bridge or anywhere on the instrument using the included non-marring, reusable, solvent-free adhesive compound. The low-profile lightweight design will not interfere with the balance or performance of the instrument. The C411L features a 3-pin mini XLR connection that is designed to integrate with the B 29 L battery power supply, MPA III L phantom adapter and AKG WMS series bodypack transmitters. The Figure 8 polar pattern accurately captures audio signal from the left and right sections of the capsule. This allows for various placement throughout the surface of the soundboard. The included reusable adhesive compound secures the microphone to the soundboard without marring.